Addressing Western and non-Western music, composers from Francesca Caccini to Charles Ives, and musical communities from twelfth-century monks to contemporary opera queens, these essays explore questions of gender and sexuality. Musicology and Difference brings together some of the freshest and most challenging voices in musicology today on a question of importance to all the humanistic disciplines. 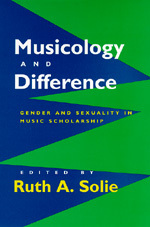 Ruth A. Solie is Professor of Music at Smith College.